Madonna's outfit at the Video Music Awards had elements from North Africa's Amazigh people. 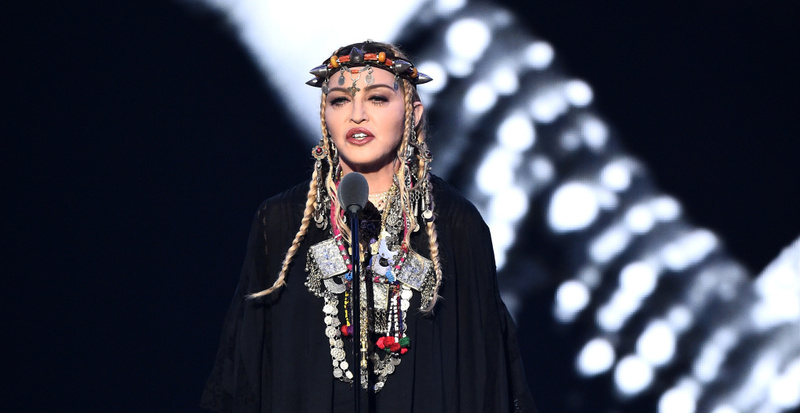 Madonna is no stranger to controversy, and she stirred it again last night when she showed up to the MTV Video Music Awards (VMAs) on Monday night wearing jewelry and garb from North Africa's Amazigh people. Fashion critics had a field day. They condemned her for cultural appropriation and mocked her stylistic choices. "It's a little insulting how people are just saying, 'What is she wearing?' and making fun of it without trying to find out about it," says Cynthia Becker, an associate professor of African art at Boston University, who specializes in Amazigh (pronounced ah-ma-ZEER) art. She's the author of Amazigh Arts in Morocco: Women Shaping Berber Identity. The clothing and jewelry reflect the fashion of the Imazighen (pronounced ee-ma-ZEERen, the plural form of Amazigh), who live in Morocco, Algeria, Tunisia, Libya, Mauritania, Western Sahara, the Canary Islands, as well as parts of Mali, Egypt and Niger. They're often referred to as Berbers but many Imazighen people consider the term derogatory – it's a 19th century nomenclature derived from the Greek word "barbaria," meaning barbarians. Imazighen, from their language Tamazight, ]means "free people." In Morocco, an estimated 40 to 60 percent of the population is of Amazigh descent, but only in the last couple decades has their language and culture been officially recognized and promoted by the government. That's why markets are now full of pieces like the ones Madonna was wearing. Traditionally, Becker says, an Amazigh man would give this kind of jewelry and textiles to their bride before the wedding. The bride wore the gifts during the ceremony and afterward in their day-to-day life as a sign of her marital status. Becker says the jewelry also served as a type of "portable bank account" that a woman could cash in if her husband passed away or the family experienced financial hardship. In addition to being "portable wealth," writes Courtney Stewart, senior research assistant, deparrtment of Islamic Art at the Metropolitan Museum of Art, "coins make a great noise when the wearer moves. So a group of women wearing the jewely "would have a significant auditory component." In an email to NPR, Stewart also notes that the color red, in the coral in the headband "is sometimes associated with feminity and fertility." And the gemstones in the headband, including coral, are thought to provide Baraka – blessings." The three square boxes in the necklace, she says, "may originally have been designed to hold protective verses inside – usually from the Quran." Sahar Amarir, 25, is a Moroccan Amazigh graduate student who is studying Middle Eastern politics at Harvard University. She says she recognized Madonna's headdress as one that is only worn by the Ait Baamrane tribe, which had fiercely resisted colonization. "If I'm walking in the street and I see this woman, I would never confuse her for a Berber of any other type," says Amarir. Although many Amazigh headdresses have cones, she says that only those worn by women in the Ait Baamrane tribe have such prominent horns. Becker says that women in southeastern Morocco have told her that they wore bracelets with large points as weapons in the past. Some women also say the horns are a symbol of fertility, and silver is believed to have protective properties against the evil eye. Becker says the aesthetic of a strong Amazigh woman is conveyed through the jewelry. "A beautiful Amazigh woman is one that is fierce and strong and powerful and can work hard," she says. Amazigh women haven't worn this kind of jewelry and garb in their daily life since the 1960s, according to Becker. As Morocco continues to develop, they're opting for Western styles, although brides may still take wedding photos in traditional dress. "I often see in many of the shops in Marrakech, they'll take many of the old Amazigh pieces and put them together to create something more modern, and I think that's largely what [Madonna's] wearing," Becker says. It's sad, she says, because Moroccan museums have very few old silver pieces now, since most of them have been taken apart, reconstituted and sold. "But who am I to decide? I think it's ultimately up to people to decide what they want to preserve." As for Madonna co-opting the style for herself? Becker says she's not wearing a traditional outfit anyway. The pieces themselves are "an amalgamation of styles from different parts of southwestern Morocco," her braids are very common in the area of Guelmim, in southern Morocco, and at least one of her bracelets is South African beadwork. That's not the only cross-cultural element. Courtney Stewart points out that Madonna is wearing "Christian-style crosses around her neck, which is atypical of Berber jewelry as Berbers are predominantly Muslim." As for the issue of cultural appropriation: Becker's husband, Addi Ouadderrou, a Moroccan Amazigh, says he understands the concern but it doesn't bother him. "I think it's fine what Madonna did," says Ouadderrou. "If someone comes to Morocco and wants to wear our clothes, to me, that's an honor; that's not an insult."